The Best Schools | Thomas Armstrong, Ph.D. This material is adapted from my book The Best Schools: How Human Development Research Should Inform Educational Practice (ASCD, 2006). I believe that the best schools in America and around the world aren’t those that have the highest test scores, but rather, those that address the true developmental needs of their students. Instead of making academic achievement the primary focus of learning, we need instead to concentrate on the development of the whole human being. This requires a deep understanding of the stages of development that children go through from infancy to adulthood and an integration of human development theory with educational practice. As a way to guide thinking and practice in this area, I suggest that our schools be structured according to to four key developmental component. These four developmental goals are important at all ages, but are particularly significant at these specific stages of growth. Early Childhood Education (Preschool and Kindergarten) — Key Developmental Focus: Play. Children up to the age of five or six should spend the majority of their time engaged in free play facilitated by teachers who have a deep understanding of a young child’s social, emotional, cognitive, physical, and creative growth. Formal math classes and reading instruction have no place in this scheme and are not developmentally appropriate at this age. Kids should be involved in make-believe play, building with wooden blocks, free painting, open-ended science experiments and math explorations, dancing to music, singing, sharing, exploring the outdoors, enjoying games, and just generally having a good time! These are the types of activities that provide the best foundation for later formal schooling. Kids between the ages of six and eleven have left the chrysalis of the home and neighborhood environment and emerged into a fascinatingly complex and interconnected world that has its own rules, dimensions, structures, and customs, and children at this age want and need to know all about this amazing universe. So, children at this stage should learn about world cultures, human diversity, science, anatomy, national traditions, the arts, how machines work, computers, biodiversity, history, and much much more. Here is becomes important to teach the symbol systems of reading and math, but this should be done only in close conjunction with rich experiences of the real world. The best learning approaches are those that either bring the contents of the world into the classroom (e.g. making the classroom into a rain forest or micro-community), or going out into environments where they can have authentic “being-there” experiences (e.g. museums, ecosystems, historical sites etc.). Children should not at this age be subjected to learning facts and skills in isolation (e.g. Direct Instruction), or learn in ways that are artificial or inauthentic (e.g. Core Knowledge Curriculum). Middle School (Grades 6 through 8) – Key Developmental Focus: Social, Emotional, and Metacognitive Learning. Students at this age are entering puberty and undergoing a wide range of powerful biological, social, and emotional transformations. To attempt to ignore these changes, and simply charge ahead with an increasingly abstract academic curriculum, is to invite acute disruption in its many characteristic forms at this age including vandalism, violence, gang membership, drug abuse, sexual misconduct, bullying, truancy, mental health problems, and basic apathy. Students at this age require educational environments that put a premium on creating small learning communities, where a sense of belonging can be fostered, and affective learning, where the academic curriculum can be taught in direct relationship to topics that are intimately connected to the teen’s own life (e.g. learning history by interviewing grandparents, learning science by improving the local ecosystem, mastering literature by reading books with social justice themes, such as the holocaust and the civil rights movement). In addition, because young teens are going through a neurologically-based cognitive “spurt” in their thinking, where they can now “think about thinking”, they should be taught a wide range of meta-cognitive strategies in such areas as: how to read and study more effectively, how to solve problems in math and science, how to write computer programming code, how to cope with personal problems, and how to resolve conflicts in peer relations. High School (Grades 9 through 12) – Key Developmental Focus: Preparing Students to Live Independently in the Real World. As students grow into their middle and late teens, they gradually acquire a new level of maturity, as seen neurologically in the increasing amount of pruning (selective elimination of brain cell connections) and myelination (insulation of nerve pathways) going on in areas of the brain responsible for reflection, self-control, empathy, and self-regulation (primarily in the prefrontal cortex). For more information about the developing adolescent brain see my book The Power of the Adolescent Brain: Strategies for Teaching Middle and High School Students.Learning at this age should be mostly outside of the classroom, in programs where they can engage in meaningful work roles in preparation for adulthood. These include: internships, apprenticeships, service learning, job shadowing, cooperative education, entrepreneurial enterprises, and other real life learning experiences. Within the school itself, students should be involved in career academies, theme-based magnet or charter schools, or other programs where they can simultaneously learn academics in preparation for post-graduate study, and pursue one or more career interests through vocational training. Our contemporary world is beset with many problems including poverty, disease, nuclear proliferation, regional wars, pollution, and mental illness. If we’re going to prepare our students for life, we need to educate them not as efficient test-taking machines, but as whole individuals encompassing their physical, social, emotional, cognitive, creative, and spiritual selves. By narrowing our focus to only academic achievement and raising test scores, we risk leaving our children and adolescents unprepared for the challenges of the 21st century. How do we best equip our kids to deal with these problems? By worrying them to death about how they’re going to do on next week’s test? By threatening that they won’t graduate if they don’t muscle under and memorize the latest list of vocabulary words? By taking away their favorite activity if they don’t keep up their grade point average? By taking them out of the sandbox at age 3 and plunking them down at a computer station? Only by standing back from the myopic view and seeing our students in terms of their whole development will we have a good chance of saving this planet and transforming it into a place that is safe for human beings and other living things. Armstrong, Thomas. 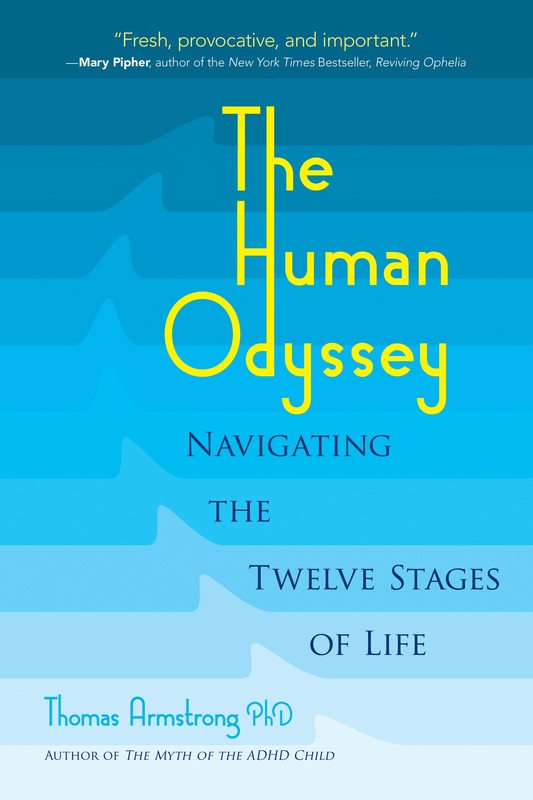 The Human Odyssey: Navigating the Twelve Stages of Life. New York: Sterling, 2008. Armstrong, Thomas. The Best Schools: How Human Development Research Should Inform Educational Practice. Alexandria, VA: ASCD, 2006. Bos, Bev. Tumbling Over the Edge: A Rant for Children’s Play. Turn the Page Press, 2009. Dewey, John. Education and Experience. New York: Free Press, 1997. Diamond, Marian. Magic Trees of the Mind: How to Nurture Your Child’s Intelligence, Creativity, and Healthy Emotions from Birth Through Adolescence. New York: Plume, 1999. Edwards, Carolyn, The Hundred Languages of Children: The Reggio Emilia Experience in Transformation. Westport, Ct: Praeger, 2011. Elkind, David. The Hurried Child, 25th Anniversary Edition. Cambridge, MA: DaCapo Press, 2006. Elkind, David. Miseducation: Preschoolers at Risk. New York: Knopf, 1996. Elkind, David. All Grown up and Nowhere to Go: Teenagers in Crisis, Rev. ed. Cambridge, MA: DaCapo Press, 1998. Erikson, Erik. Childhood and Society. New York: W.W. Norton & Co., 1993. Froebel, Friedrich. The Education of Man. Dover Publications, 2005. Gardner, Howard. Frames of Mind: The Theory of Multiple Intelligences, 3rd Ed. New York: Basic Books, 2011. Gardner, Howard. Multiple Intelligences: New Horizons in Theory and Practice. New York: Basic Books, 2006. Glasser, William. Choice Theory in the Classroom. New York: Harper Perennial, 1998. Harris, Judith Rich. The Nurture Assumption: Why Children Turn Out the Way They Do. New York: Free Press, 2009. Healy, Jane. Your Child’s Growing Mind: Brain Development and Learning From Birth to Adolescence. New York: Three Rivers Press, 2004. Healy, Jane. Endangered Minds: Why Children Don’t Think And What We Can Do About It. New York: Simon & Schuster, 1999. Miller, Alice. The Drama of the Gifted Child: The Search for the True Self. New York: Basic Books, 2008. Montessori, Maria. The Secret of Childhood, 2nd ed. Orient Blackswan, 2009. Montessori, Maria. The Absorbent Mind. New York: Holt, 1995. Neil, A.S. Summerhill School: A New View of Childhood, Rev. ed. New York: St. Martin’s Griffin, 1995. Noddings, Nel. Happiness and Education. Cambridge, England: Cambridge University Press, 2004. Ohanian, Susan. What Happened to Recess and Why Our Children Are Struggling in Kindergarten. New York: McGraw Hill, 2002. Olfman, Sharna (Ed.). All Work and No Play: How Educational Reforms Are Harming Our Preschoolers. Westport, Ct.: Praeger, 2003. Olfman, Sharna. Childhood Lost: How American Culture is Failing Our Kids. Westport, Ct.: Praeger, 2005. Pearce, Joseph Chilton. Magical Child. New York: Plume, 1992. Piaget, Jean. The Psychology of the Child. New York: New York: Basic Books, 1969. Pipher, Mary. Reviving Ophelia: Saving the Selves of Adolescent Girls. New York: Riverhead, 2005. Postman, Neil. The Disappearance of Childhood. New York: Vintage/Random House, 1994. Rogers, Carl. Freedom to Learn, 3rd ed. New York: Pearson, 1994. Singer. The House of Make-Believe: Children’s Play and the Developing Imagination. Cambridge, MA: Harvard University Press, 1992. Steiner, Rudolf. The Kingdom of Childhood: Introductory Talks on Waldorf Education. Anthroposophic Press, 1995. Rousseau, Jean-Jacques, Emile, or On Education. New York: Basic Books, 1979. Vygotsky, Lev. Mind in Society: The Development of Higher Psychological Processes. Cambridge, MA: Harvard University Press, 1978. Werner, Heinz. Comparative Psychology of Mental Development. Percheron Press/Eliot Werner Publications, 2012. Wickes, Francis. The Inner World of Childhood. Sigo Press, 1988. Winnicott, D.W. Playing and Reality. London: Routledge, 2005. For further information, see my book The Best Schools: How Human Development Research Should Inform Educational Practice (ASCD, 2007). To schedule a keynote or workshop on the best schools go to the Keynotes and Workshops page.